TURTON Rotary Club had another successful year when eight local schools and nurseries took part in the shoebox scheme, which sees them sent to underprivileged children. President Alan Smith said: “A shoebox is very often the first present that a child will ever receive and when it arrives it lets them know that somebody, somewhere, cares. The shoeboxes will be sent to children and teenagers in Eastern Europe who are in orphanages, hospitals and those that have no home and live on the streets. The schools taking part this year were: St John's (Bromley Cross), St Columbas, Walmsley, Egerton, Moorside Primary Schools, Eagley Infant School, Eagley School Nursery and Beechwood Nursery. TURTON Rotary Club's Christmas sleigh will be out and about North Bolton bringing Christmas cheer to children and adults alike. 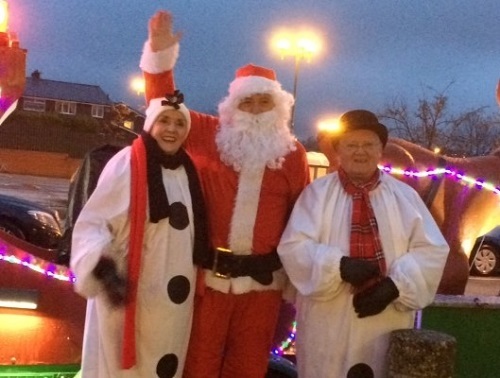 Santa and his snowmen will once again tour the streets raising money for charity and kick off with a busy day on Friday November 30 when they will be at the Co-op store at Bromley Cross during the day and at Edgworth in the evening for the Christmas tree lights switch on. President Alan Smith is hoping for another bumper year.
" He said: "The sleigh is always popular as much with adults as the children. Our members, together with rotarians from the Bolton with Le Moors club, will once again be on the streets and at local supermarkets raising money. We have become the face of Christmas in the area. "The club's Christmas Sleigh Appeal has been in operation for many years, and we are very proud of the fact that more than £280,000 has been raised in that time and we are hoping for another successful year. "We must also thank RRG Bolton Toyota for the loan of their liveried car, plus local supermarkets Asda, Morrisons, Sainsbury's and the Co-op for allowing us to collect outside their stores." Friday November 30 - Chapeltown Church tree lighting and The Barlow, Edgworth from 6.30pm approx. AN exciting new Rotary initiative, set up to help the local community, is launching its first fundraiser with Swim4life at Turton Leisure Centre pool on Saturday October 27. Turton Trailblazers, launched as a spin off from Turton Rotary Club, is an informal and fun club which hopes to raise sponsorship for 'Special Care for Special Babies' at the Neonatal Unit at Bolton NHS Foundation Trust. Organisers are hoping to attract enough swimmers to complete 32 kilometres or 1320 lengths of the pool, the equivalent of swimming the English Channel. The event will be held between 7.30am and 2.30pm and entrants can swim as many lengths as they wish, which will be added to the collective total. Turton Trailblazers co-ordinator Neil Wharmby said: “We are very excited about the launch of our new satellite group and feel that our first event is a great way for the community to get involved and contribute to a worthwhile cause. “We are also hoping the event may attract new members to the Trailblazers. We are open to anyone who can give a little of their time to make a difference in our community. Anyone wishing to take part in the free event can simply visit the website www.turtontrailblazers.com, where they can enter and download a sponsorship form or ring Neil on 07912078300. 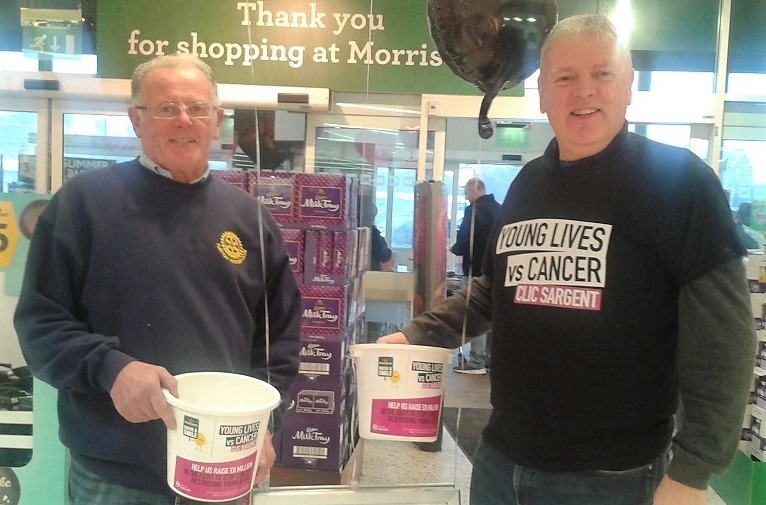 TURTON Rotary members have been very busy over the week 20th Aug to 26th Aug helping out our friends at Morrisons collect for their chosen charity 'CLIC Sargent', the UK’s leading cancer charity for children, young people and their families. The public have responded superbly by donating £1470.74, all of which will be sent to the charity. Turton Rotary and Morrisons have an excellent relationship and during the collection period Morrisons staff made us feel extremely welcome and appreciated for which we were very grateful and only too pleased to have helped out. President Alan Smith(right) and treasurer Colin Roberts are pictured with a Morrisons representative outside the store. TURTON Rotary sponsored Destiny and Saaemah from Sharples High School on the RYLA course at Petty Pool. In total 11 students from around the North West attended and they were given total freedom to come up with their own ideas on how to plan, design, construct and implement a play area for primary school children. 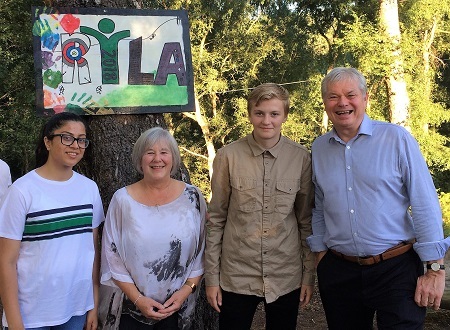 The students took real pride in their work and were incredibly enthusiastic and proud to showcase their efforts to their Rotarian sponsors who were invited to the awards ceremony. 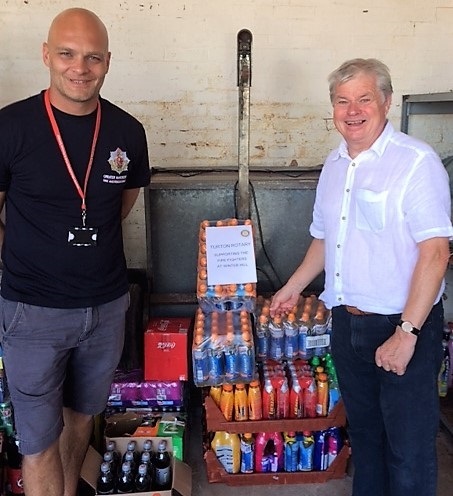 TURTON Rotary Club president Alan Smith (right) hands over 50 bottles of Lucozade and 36 high protein bars to help the firefighters battling the moorland blaze on Winter Hill. Hannah Crawford, events co-ordinator at the Last Drop Hotel receives a certificate of excellence from Turton Rotary Club president Peter Gaskell - one of a number handed out as a thank you for their help with the Christmas sleigh appeal. The others are RRG, Asda, Morrisons, Sainsbury's and the Co-op. 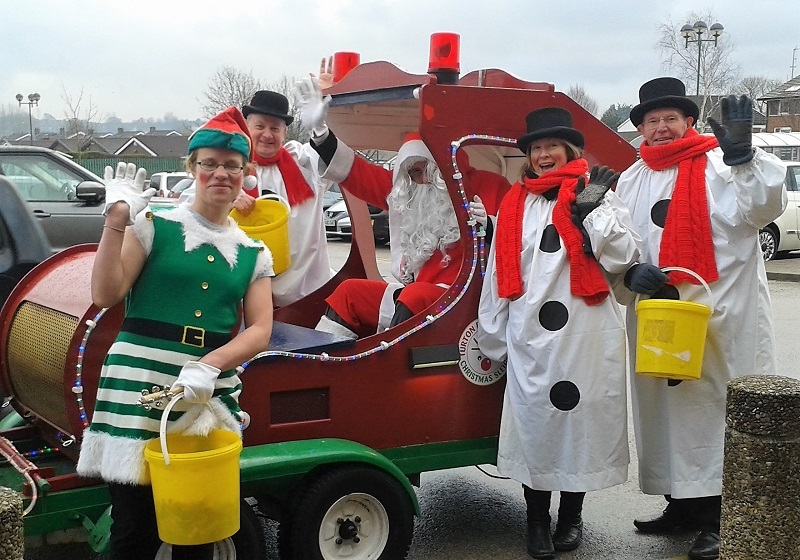 TURTON Rotary Club members will take a bit of a breather after a hectic Christmas on the sleigh, before launching into their next bid venture - their annual duck race. The popular event, held again on Bradshaw Brook at Bradshaw Cricket Club, will take place on Sunday, June 10. Each year the club asks local businesses to support the duck race and add their name on our businesses supporters list, which goes on to all 18,000 tickets. This type of support is vital to help with the costs of the event and also as a timely boost to our charity fund. Anyone who would like details on how to help call Jim Turner, the duck race promotor, on 01204 853363. Many local charities benefit by taking duck race tickets and selling them for their own cause. They keep all the money they raise and it is a great way for any charity to a make some serious money. Once again this year there will be several great cash prizes on offer for the first ducks over the line. TURTON Rotary Club is celebrating another bumper year of donations after it raised £7,666 on its Christmas sleigh appeal. The club, in conjunction with Bolton-le-Moors Rotary Club, had a busy time during the festive fundraiser, which ran for four weeks in the lead up to Christmas. Father Christmas and his sleigh, with the help of snowmen, toured the streets of north Bolton, handing out sweets and collecting donations and also made appearances at local supermarkets, where shoppers gave generously. Peter Gaskell, the club president, said: “I am delighted with the generous response from the people of Bolton. “A lot of hard work goes into making sure the sleigh is operational, and our members give up their time generously, but it is all worthwhile when you see the look of joy on the children’s faces. The president added: “Thanks must be given to supermarkets Morrisons at Harwood, Asda at Astley Bridge, and the Co-operative and Sainsbury's supermarkets and Greenhalgh's bakery at Bromley Cross for allowing us to collect at their stores. 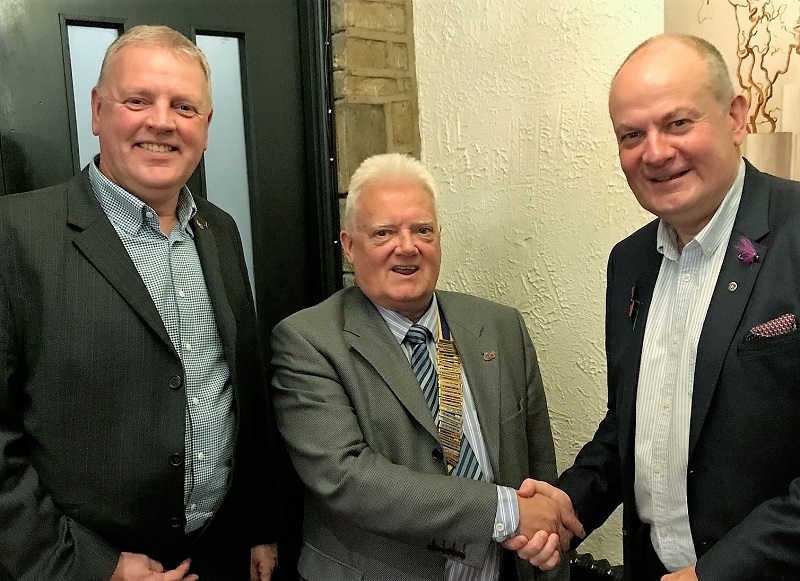 “We must not forget to thank our colleagues at the Rotary Club of Bolton-le-Moors for their help and assistance in what has proved to be a very successful collaboration. The money will be split between a range of local good causes and rotary charities. The Christmas Sleigh Appeal has been in operation for more than 20 years and has raised more than £260,000. Anyone who has seen what the Rotary Club of Turton do at Christmas with the sleigh collections, and like what they see, then there is an open invitation to come and visit the club. They meet each Thursday at the Last Drop at 6pm or visit our website at www.turtonrotaryclub.org.uk to find out more about what we are about. Welcome to the club. 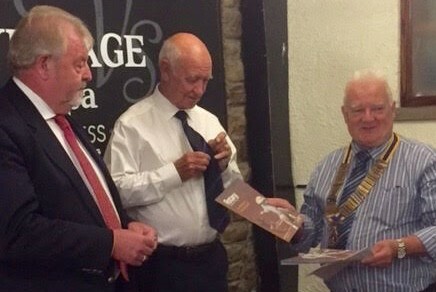 One of Turton's latest members Mark Telleck (right) is inducted by president Peter Gaskell (centre), with his sponsor Neil Wharmby looking on. Welcome to the club. One of Turton's latest members Lynne Joule is inducted by president Peter Gaskell (right), with her sponsor Andrew Whaller looking on. 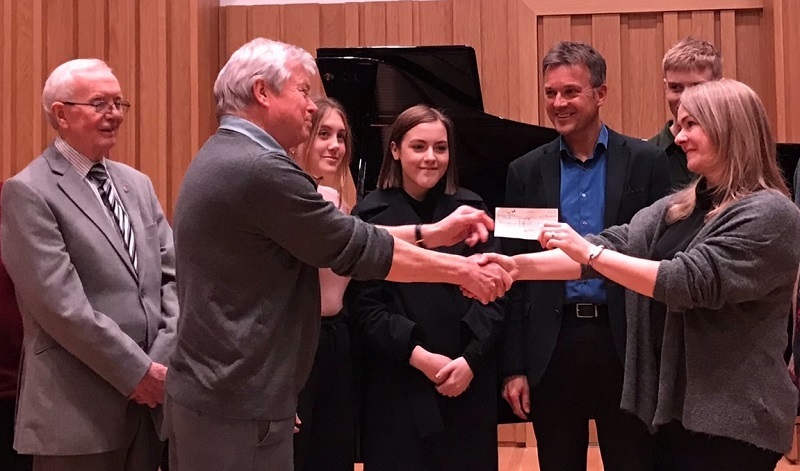 Turton Rotary Club vice-president Alan Smith hands over a cheque to Chethams School of Music for £1000 which will help fund the school's recent trip to Uganda where they held workshops in schools and orphanages before playing before the heads of Commwonwealth states. The money was raised when the club organised a concert at Dunscar Conservative Club, where the pupils performed. Turton High School student Lydia Collins shows off her certificate after taking part in the rotary sponsored RYLA scheme. The club are fully supportive of the scheme and every year sponsor at least one student from local schools to go on a five-day course at Petty Pool outdoor centre in Cheshire. RYLA is a leadership programme coordinated by rotary clubs around the globe. Each year, thousands of young people participate and are sponsored by rotary clubs to attend the event. Participants are chosen for their leadership potential.. The format of the event takes the form of a seminar, camp, and workshop to discuss leadership skills and to learn those skills through practice. Turton Rotary Club's donation of £500 to the Alexandra Nursery in Bolton, was gratefully received by headmistress Mrs Barbara Kenny as it helped the nursery buy a large amount of outdoor play equipment and trollies for wheeling them in at night to prevent vandalism, which is a serious problem in their area. Past president Andrew Waller hands over a cheque for £580 to the Wipe your Tears charity based in Farnworth, which helps families with young children, especially from broken homes. Andrew presented the cheque to Wendy Hutchins, chief executive and her daughter Genny the charity coodinator with Liz Waller looking on. TURTON Rotary Club raised £2000 when when they held a charity evening in aid of the Christie NHS Foundation Trust. 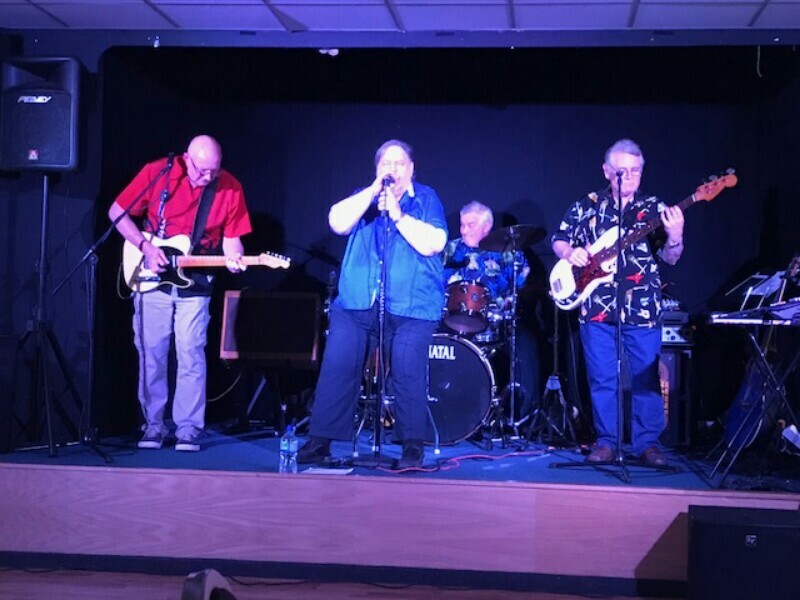 Star performers Arthur Writeus and the Hip Joints, pictured above, topped the bill at Dunscar Conservative Club with Gary Ryan, starring as Neil Diamond, in support. 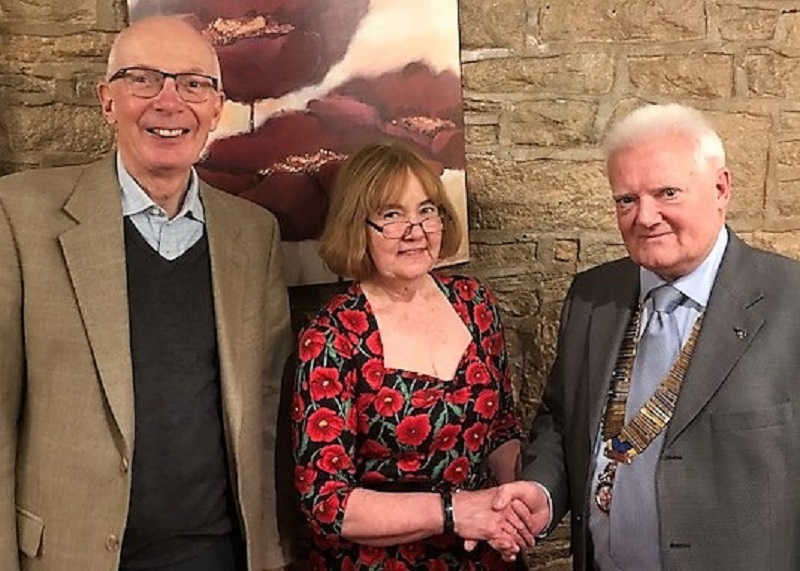 Immediate past president Andrew Waller (left) hands over a cheque for £500 to Christine Ogden, a local organiser from Muscular Dystrophy UK, as president Peter Gaskell looks on. Welcome home for Graham Howarth (centre) and Bill Taylor, former members who returned to the club and were inducted by president Peter Gaskell. 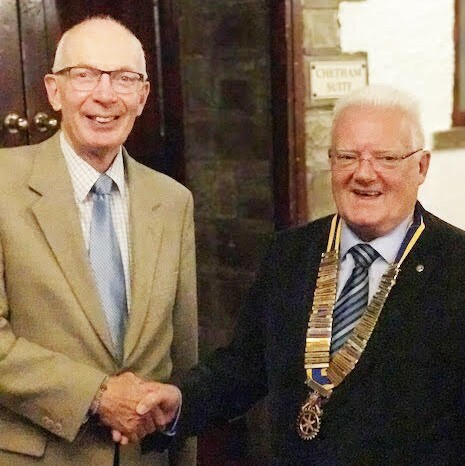 TURTON Rotary Club's new president has come up with a smart plan to raise money. 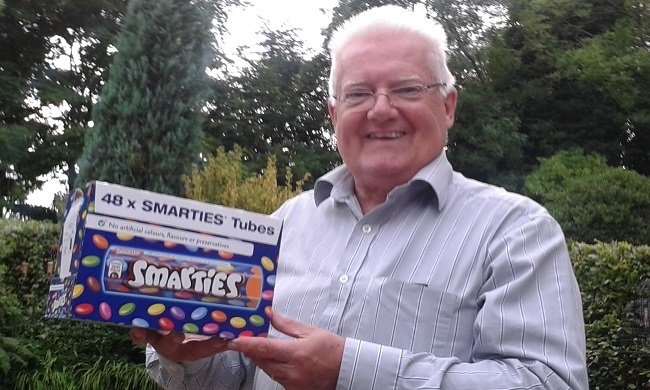 Peter Gaskell has decided to replace the weekly 'box for others' collection at the Thursday meetings with a box of Smarties he is hoping the members will fill with 20 pences. He said: "I thought 20 pences would fit in there nicely so decided to give every member a box of Smarties and hope they return it full at the end of 12 weeks. "Each box holds about £10 worth so we could raise about £200 every three months. "That will be divided equally between Foundation and local charities and the club will also benefit as it will be gift aided." 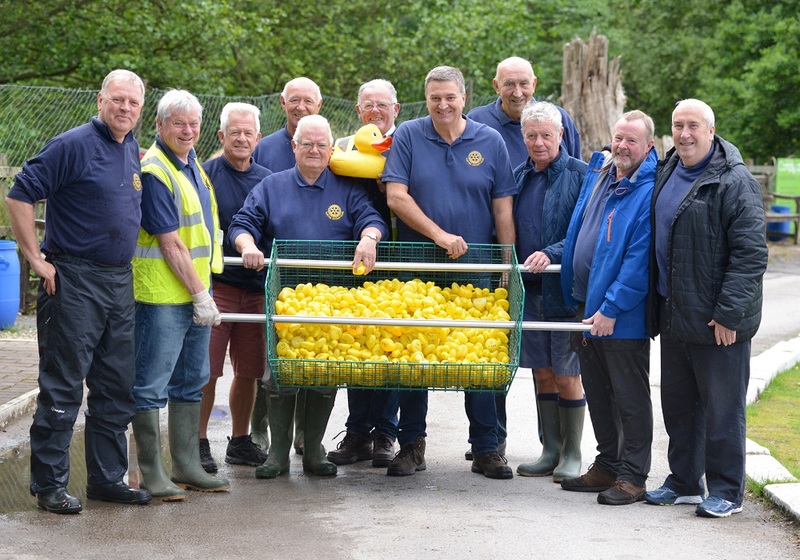 IT was a photo finish at this year's Turton Rotary Club duck race when thousands of pounds were raised for 35 local charities. The final stretch saw a group of a dozen ducks all bunched together as they bobbed their way down the fast-flowing Bradshaw Brook, cheered on by a large crowd who had come out to support the annual event. It was an exciting finale to another successful day at Bradshaw Cricket Club, with families lining the route. The final figure of £7,500 was not as high as in recent years but organisers were still delighted with the outcome. The competition sees 2000 numbered plastic ducks, which all correspond to tickets sold, released into the brook over two heats with each of the winners going into a grand final. First duck home wins the £1,000 first prize with four more cash prizes. There is also a children's race, with tickets bought on the day, which was won by Shannon Parkinson. Race organiser Jim Turner was delighted with the response. "It was perfect duck racing weather as we had a fast-flowing stream that kept the ducks moving," he said. "Thanks must be given to our sponsors and everyone who helped make it another successful day and all the hard work worthwhile." Some of the many charities to benefit this year include Lagan’s Foundation, Walmsley Unitarian Church, Griffin Explorers and Derian House. Mr Turner added: “The duck race has probably been going now for 25 years and it has grown over the years. “It has become a part of the social calender. “A number of charities sell tickets to raise money and we and other rotary clubs sell tickets too. “This year we have had a lot of local businesses support the duck race and from that alone we have raised £3,000 for which we are very grateful. The first prize of £1,000 went to Jon Makin from Little Lever, second prize of £200 to Edith Pierce from Horwich, third prize of £100 won by Graham Howarth, fourth prize of £75 by Joy Sherlock and fifth prize of £50 was won by Roy Edge. Click on 'What We Do' at the top of the page and then Turton Duck race for more pictures.